She's volatile and impulsive, her see-sawing emotions punctuated by bursts of inspired creativity. Occasionally, her luminous personality shines like the full moon; equally frequent, however, are periods of dysfunctional darkness. The rest of the time she vacillates between these extremes, so that one usually finds her in genteel decline or in the throes of painstaking recovery. He's stolid, dependable, as regular as tomorrow's sunrise. He gets up every morning to catch the train and is always home on time for dinner. At work he's efficient, productive and a stalwart upholder of company policy. His steady gaze benignly looks upon the effervescent surface of his spouse's life. As can be expected, theirs is not an easy marriage. Their lives do not turn in tandem. Often one sees him forging ahead, her wan figure trailing behind; other times it is he who lags behind as she's impelled forward by one of her bursts of momentum. But they keep at it. Once every nineteen years their efforts are rewarded. Their disparate life-trajectories merge, and they enjoy a moment of harmony. The first thing that the newly-born nation of Israel was told to do as they prepared to leave Egypt was not to circumcise themselves, proclaim a state or bake matzos. It was to formulate the Jewish calendar. Time, after all, is our most precious resource; when it comes down to it, time is all we've got. More than anything else, the way that we quantify and experience time defines who and what we are. And the Jew has what is probably the most complex calendar known to man. What makes the Jewish calendar so complicated is its insistence upon reconciling the solar and lunar cycles into a single system. The 29.5 day lunar cycle is the source for the time unit we call "month"; the 365.25 day solar cycle produces the annual cycle of seasons we call "year." The problem is that these two cycles are not compatible with each other — twelve lunar months add up to 354 days, more than 11 days short of a solar year. So most calendars pick one of these systems and run with it. The lunar-based Moslem calendar, for example, completely ignores the solar cycle. And the solar-based Gregorian calendar (the "secular" calendar that has become a near-universal standard) is completely disassociated from lunar time. But in the first mitzvah to be commanded to the people of Israel, G‑d instructed Moses to base the Jewish calendar on the phases of the moon, yet to also make it consistent with the solar seasons. The only way to marry these two diverse time-trajectories (without compromising the integrity of either system) is to create a nineteen-year cycle that includes six different types of years: the Jewish year consists of either 12 or 13 months, and is either 353, 354, 355, 383, 384 or 385 days long. On the third year of the 19-year cycle (by which time the lunar "year" has fallen 33 days behind the solar) an extra month is added, which almost, but not quite, closes the gap. On the 6th year, the process is repeated. On the 8th year, a 13th month actually set the lunar year a few days ahead. But not for long. Soon it once more lags behind. Only at the close of the nineteenth year do the two time-cycles converge. Why make things so complicated? Because Jewish life is driven by the determination to effect a marriage between these two unlikely spouses. Jewish time is basically lunar, linked to the moon's monthly rise and fall. Like the moon, we experience times of decline, even moments of obliterating darkness, only to rise again to luminescent fullness. We live our lives with the moon because we wish to harness the distinct qualities of lunar energy: its courage and creativity, its capacity for renaissance and rebirth. But we are equally determined to incorporate into our lives the surety and continuity of the sun. Life must be creative, but it must also be grounded in unequivocal truths; life is about perpetual self reinvention, but also about faithfulness and consistency. Trying to ride both time-streams simultaneously is no simple task. The easiest thing to do would be to get a divorce and follow one path through life. But Jews are notorious for their refusal to accept the easier solution. The Lamplighter Rosh Chodesh Elul תשע׳ח After he descended the steps in Heichel Menachem in Jerusalem to farbreng in the middle of the week of יב and יג of תמוז, he began to explain what a lamplighter is. He said it's a "Lantern-chick". Until he finished and questions ceased he was then able to describe in a deeper way with great glee, "It's a person who would light the street lamps with a very long stick or pole so others could see their way through the deep darkness which pervaded any given שטעטל." 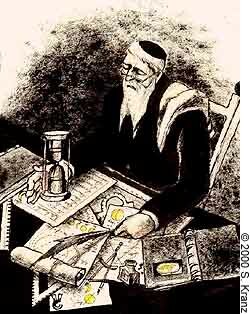 Rav Gafne was no stranger here where he lit many a lamp! He kept us all glued to our seats once again. It was a "Lanternchick" to aspire to be in life. Almost twenty years passed until I saw Chabad.org's miracles of lighting in all corners of the earth on video. Yet the Lanternchiks lighting their Menorah under water with sharks as their neighbors made his remarks become clear. "One has to be willing to make light in the depths of the ocean," but how? Yet "no amount of water can extinguish one's love of..."
The current calendar has been "set in stone"... Unfortunately, Alexandra, the current Hebrew luni-solar calendar has been "set in stone" by Hillel II in the fourth century of the common era. When the existence of the Sanhedrin was threatened, he formally sanctified all the months and intercalated all the years until such a time that another (genuine) Sanhedrin will have reconvened. The cornerstone of the Hebrew calendar as related to the solar year is that Passover MUST fall (or maybe just start) in the spring (between Vernal Equinox and Summer Solstice). So as long as Passover will satisfy the "spring-time" requirement, chances are that the calender will remain unaltered.